A dominant charity shopping gene runs in my family. When I met the French friend I jokingly call “Emmamuse”* just over a year ago, I told her that one of my hobbies was bargain hunting in charity shops. I expected her eyes to glaze over, but they lit up with enthusiasm – and our friendship was sealed. Last Thursday, we leapt into the car and screeched off across the countryside like Thelma and Louise on a quest for a good bank. Our recipe for the perfect day is simple: combine two girls, two huge charity shops and seven hours of thrifty sifting with a midday vineyard picnic or a plat du jour sandwiched nicely in the middle. The shops in question are called “Emmaüs”. This network, created by Abbé Pierre in France in 1947, is a winning combination of common sense and solidarity. Customers have access to secondhand goods at moderate prices, and the staff, called the compagnons, have dignity, work and lodgings. For someone like me who splashes her clothes with bleach and breaks crockery and glasses as a pastime, Emmaüs is the best thing since sliced bread. When we arrived, we touched base with our favourite compagnons, who we secretly call ZZ Top and Mr Cacharel. To our surprise, ZZ Top had shaved off the huge white beard that had earned him his nickname. When we congratulated him on his new look, he smirked and told us that his own granddaughter hadn’t recognised him, and had screamed when he had picked her up. Mr Cacharel works in the clothing section, and once spent twenty minutes turning the place upside down to find me the matching skirt for a Cacharel jacket I had found. Thanks to his determined endeavours, I now have a perfect suit for five euros. He even doubles up as a fashion advisor, telling you with tact and delicatesse what suits you and what doesn’t when you try things on. Yep, Mr Cacharel is 100% good egg. However, we always keep a wary eye out for the volunteer worker we have named “Adolphine”. She has made a speciality out of shadowing customers throughout the building like an offbeat Brinks security guard, stalking them with all the tact and discretion of a tank driving though an ornamental garden. In the apparent belief that she is working in a Chanel boutique crammed to the seams with aspiring thieves, she has already been seen tearing objects out of the hands of screaming children in order to stash them away at the till until they were paid for. We came to the conclusion that she was a bored lady with bad conscience who was there for all the wrong reasons, and have avoided her like the plague ever since. Emmamuse was surprisingly well behaved this week. Her hopeless addiction to 1960’s furniture, crockery and clothing sometimes results in life-size Tetris as we jam huge pieces of furniture into the car with the help of a guffawing ZZ Top. We then attempt Houdini-style contortionism on the way home: I drive with my knees around my ears and my nose squashed against the windscreen, whilst Emmamuse supports the weight of the cupboard doors dangling perilously above her head. This week, however, we got off lightly with two window frames, a small chest of drawers and the result of a substantial raid on the clothing section. 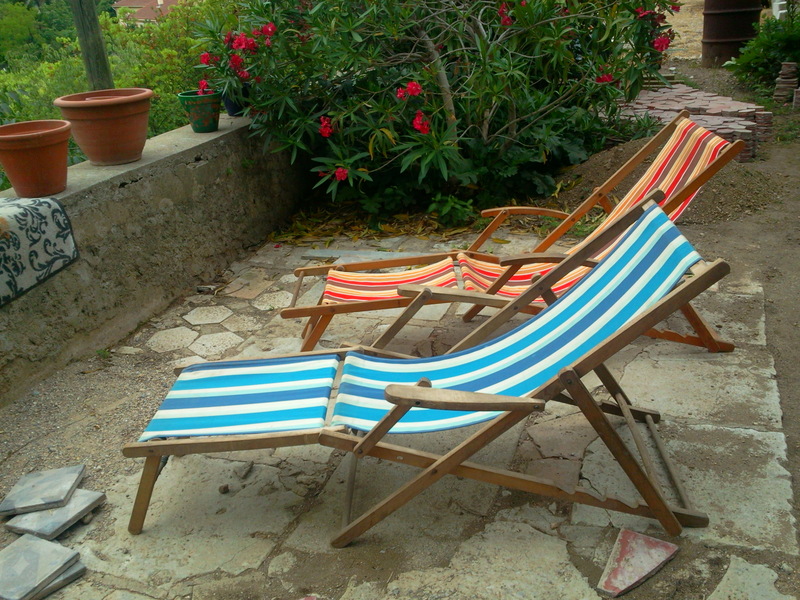 My favourite trophies this week are two very British-looking stripy deckchairs, complete with foot rests. They seem to have fallen out of Dr Who’s tardis on its way from Blackpool to an unknown destination, and have resulted in an unrequitable desire for a stick of rock, donkey rides along the beach and a “kiss me quick” hat. The rest of my hoard includes three art nouveau candleholders, a pile of clothing for a majorly impressed daughter, and crockery for the kitchen, all for the princely sum of 46 euros. Not forgetting the added, invaluable bonus of a day out with a good friend and a picnic in a sunny vineyard. What else could a girl ask for? * Emmaüs, the name of our favourite charity shop, combined with the word “muse”.